The book trailer we made? It’s unexpectedly nostalgic, isn’t it. Do share it with others who love the Lake District. the music is copyright free. We are driving up to Cumbria for an Arthur Ransome weekend this coming Friday. I haven’t been since Rob invited me up to launch Swallow, so am very excited. What country are you writing from, Pamela? I am in Australia living in the outer NE suburbs of Melbourne. There is not a lot of sailing but we have wonderful areas to where we are able to walk in the bush. It is especially good in late winter to late spring when the wild flowers are out. Several other AusTars live in the outer east of Melbourne and have a very different type of flora – but beautiful to see too. Others do live near the coast and sail on “the bay”. How wonderful. I love wildflowers. Does AusTars have a website or Facebook page? I have a good friend emigrating to Melbourne this April who I think would enjoy TARS. She is a headmistress. The web address for TARS in Australia is Arthur-Ransome.org.au/. Your friend would be very welcome to join us. There are several retired teachers in our Victorian group. I wonder if she has any idea where she will be living. At the moment we seem to be eastern suburbs of Melbourne and country area of Victoria. Many thanks. She is to be head of The Methodist Girls School. Do you have any TARS members there? I don’t think there are any members who are at that school – Methodist Ladies College known as MLC. It is in the eastern suburbs but not as far out as some active members. We have several retired teachers – both secondary and primary. I have been in contact with Jan who is acting coordinator. Our co-ordinator is Nancy whom you may have met at the literary weekend. Jan is taking over Nancy’s tasks as much as possible due to her mother’s illness. Please ask your friend to communicate with me for the time being. I will pass on anything I receive to Jan. At the moment Jan’s contact details are not on the web site. Thank you so much for your help, Pamela. I know my friend Diana Vernon is going to be really busy when she first arrives, but do let me know if you hear of anyone at MLC who is a TARS member as that would make it easier for her to link in. I find that many TARS members are teachers or academics. Do you have an email I can pass on to Diana? Many thanks again! We do not have any members at MLC. I wonder where she lives. If she phones I someone may be able to pick her up and drive her to a gathering. The next one is our annual winter dinner this month. Diana has found herself so busy as Head that she hasn’t had time to find anywhere to live yet, so she may need a while to settle in before she can have time for All Things S&A. You’ll have to get to know her by getting my other books in which she appears from time to time. All great fun. The Dog’s Home weekend sounds wonderful. I hope they have a great time and that you enjoy South Australia. Sorry! I cannot claim authorship of that very dark photograph. Sorry – I’ve changed the caption. It was one you sent me! We are off to visit TARS North at Barton in Lancashire and Rydal Hall for Margaret’s AR weekend this Saturday. Sat 3rd May is a parade of traditional boats in Horning.I am sure they will all want your new book. Congratulations on the impending appearance of the print version! I’ll be ordering it within days of its listing on Amazon.uk!. 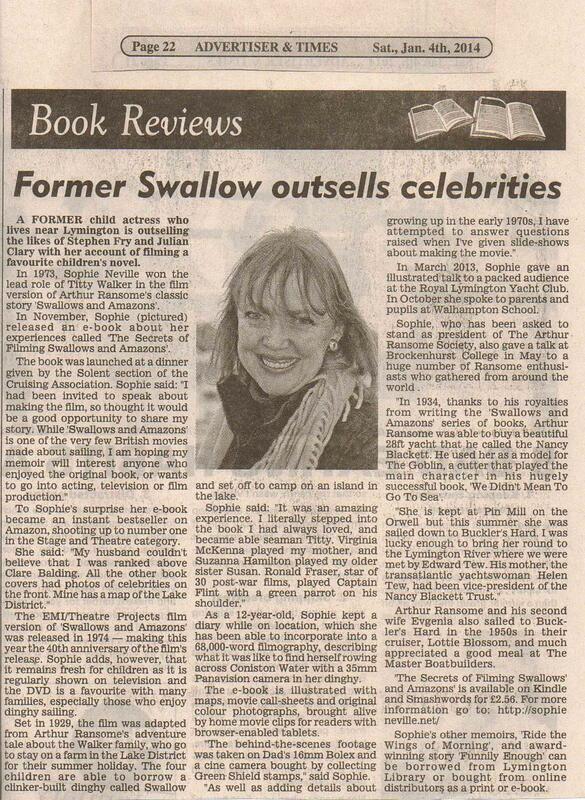 It’s great that Swallows is rebroadcast on British TV from time to time. Does it usually appear on ITV or do other channels show it? Also: Are you notified by S&A afficionados each time it’s presented? I can’t see you scanning the television schedule every day! I imagine that each showing must attract a decent audience or it wouldn’t be broadcast quite as often! Do you have the ebook of ‘The Secrets of Filming S&A’? No, I’m afraid I’m a paper book person! I’ll just be patient and one day get a copy to sit beside my diverse set of S&A titles! Glad to hear that a 40th anniversary DVD will come out. Have you been contacted for “extras”? It would be a treat to hear you and some of the other actors provide a commentary track! Sorry, I am sure you’ve already told me you were waiting for a print copy. A commentary track! You’ll have to write in to StudioCanal and request one. What else would you like to see on the ‘extras’? 2)	A retrospective “making of” that might have to draw heavily on you and your resources, Sophie! 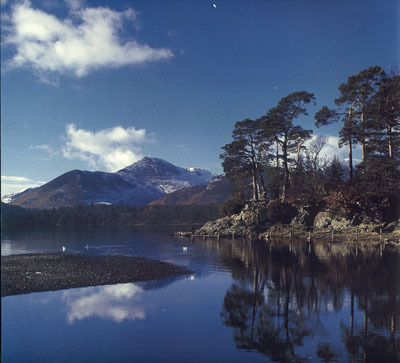 5)	How about a featurette on the Lakes District locations as they are today. Or archival footage from Ransome’s time or the time of the filming? 6)	It would have to include a mini biography of Ransome himself, preferably a short documentary and not just text. 7)	They could rustle up the black and white TV version and include that, either in whole or in part. 9)	Don’t forget, a nice illustrated booklet with maybe a contemporary review or an essay by a film historian or actor reminiscences, etc. I’m sure that others could come up with more. If StudioCanal went with one or more of the above it would be quite something! I do think I’ll write to them and suggest it! At the BBC we found letters from viewers hugely useful, and much appreciated. 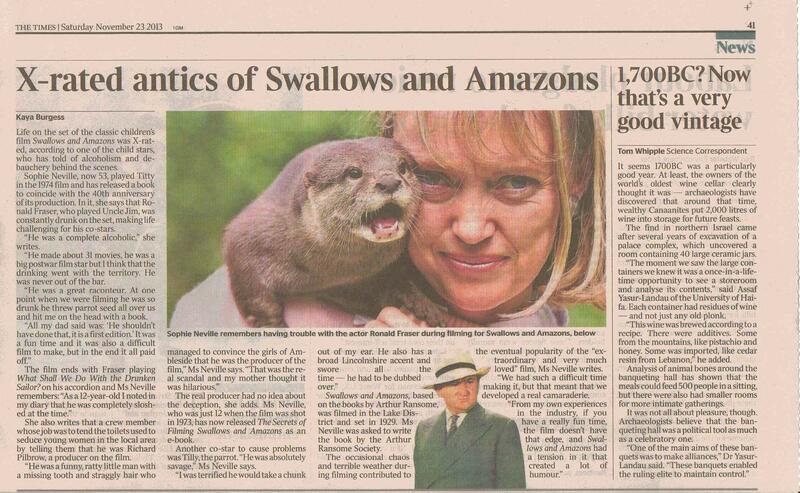 I have just remembered that ‘Animal Magic’ made an item profiling me and my green parrot soon after ‘Swallows & Amazons’ was released in 1974. The BBC might have it in their archives. 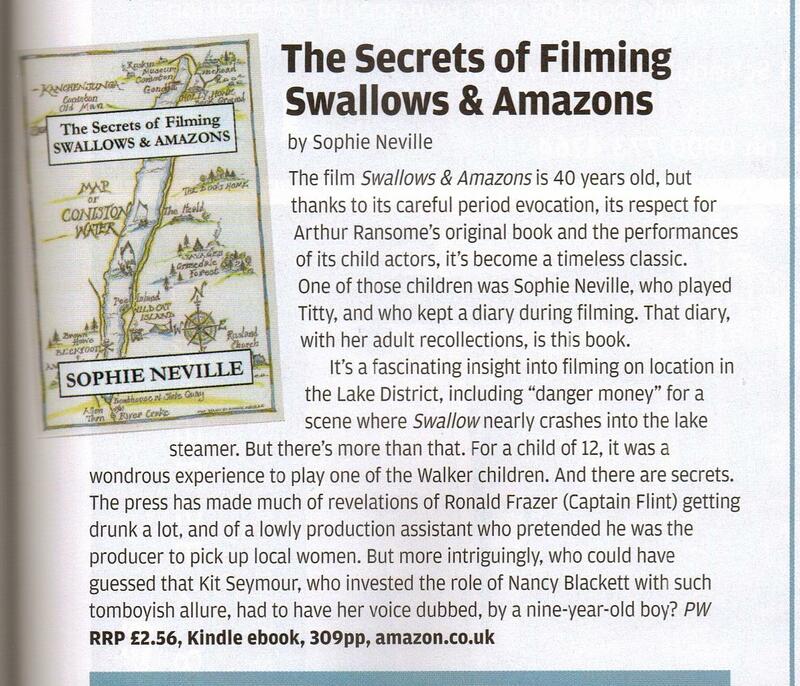 Barry Norman reviewed it on Film ’74 and we were interviewed on BBC ‘Point’s West’ ~ ‘Nationwide’. Blue Peter were asked if they wanted to come and make an item on life behind-the-scenes of ‘Swallows & Amazons’ but they turned us down. The location was probably too far from London for them and the item might have been classed as advertising or promoting a movie – which of course was why they were invited along. Lesley Judd made an item about making the BBC sit com ‘Dad’s Army’ instead. Great news that we will have a ‘real’ book! I’ll be buying it for TARS library! Yes, we have paperbacks and hardbacks planned. the photos are only in black and white but it makes a nice chunky book, with interest for all ages of reader. I hope it will inspire others to search for the locations and join TARS. Are you coming to the IAGM? I cannot wait for the print edition to come out! Looking forward with bated breath, I am!! Have you managed to get an ebook version? I have links to the official Kindle site where you can download free kindle reading app with one click. You need a touch screen for the photos to expand but it is great to have.